This 30 Excel Functions lesson guide and workbook are based on the popular 30 Excel Functions in 30 Days challenge, from the Contextures Blog. The 30 functions are shown in the list at the right. learn which functions work best in different situations. You'll even discover which Excel functions you should avoid! This lesson guide can help you make better use of familiar functions. Even the Excel functions that you use every day can have hidden talents, and pitfalls that you aren't aware of. Each of the 30 lessons in the ebook (pdf format) explains how the Excel functions work, suggests possible uses for the function, and warns you of any traps to avoid. There are multiple examples for most functions, showing practical applications that you can apply in your own workbooks. Experiment with the examples, as you follow along with the lesson plans. The ebook is 150 pages, in a generous sized 13 pt font, so it's easy to read. There are video tutorial links in the lesson guide, so you can see a demonstration of the examples. Click the video links to view the tutorials on the YouTube site. The e-book is in Adobe PDF format, with bookmarks for easy navigation. 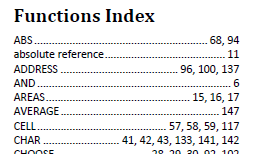 At the end of the e-book, there is an index to where each function is used in the examples. This is a great way to see how you can combine the different functions, for powerful and flexible results. With this sample file, and all its examples, you will save time and effort, and not have to build each example from scratch, in your own workbooks. There is a table of contents in the Excel file, so you can quickly navigate to the example you're looking for. Or, work through the examples, as you follow the 30 lessons in the e-book. A cheat sheet also links to the information sheet for each function, and summarizes the function's syntax and description. 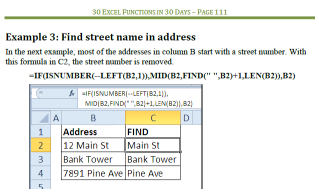 Two versions of the 30 Excel Functions in 30 Days are available. Both versions have the same ebook, with the detailed instructions, and screet shots that show the worksheet in Excel 2010. Excel xlx Format -- The Excel file is in xls format, with no macros. . Select this version if you have Excel 2003. 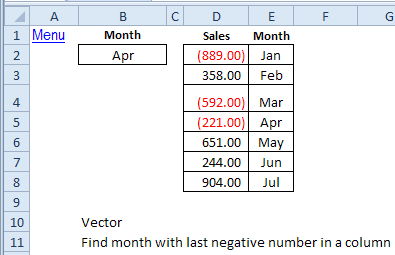 A few formulas were changed, to replace formulas, such as IFERROR, that are not available in Excel 2003. Click the Add to Cart button, to get the 30 Excel Functions in 30 Days eBook and Excel workbook. Step by step purchase instructions are listed below. You may use the downloaded material for personal or business use, but may not resell or repackage the contents. After you purchase the 30 Excel Functions in 30 Days material, you may return it for any reason, within 30 days. Your purchase amount will be fully refunded.